BEIJING -- About 160,000 people will attend the Olympic opening ceremony on Friday, according to a Beijing city government official here on Monday. About 70,000 were guests, VIPs, athletes and actors performing at the ceremony. The remaining 90,000 were the audience, staff and volunteers, said Zhou Zhengyu, the Beijing Municipal Committee of Communications deputy director, at a press conference. The authorities have tested a plan to get this huge number of people in and out of the National Stadium, or Bird's Nest, he said. The guests, athletes and artists will take chartered buses and spectators will take public transport. Staff and volunteers will begin working at the Bird's Nest on Friday morning. The whole Olympic core area, including the Bird's Nest and other stadiums in the Olympic Green, will formally open to the public from 4 p.m. on Friday. " The rush hours will be from 4 p.m. to 8 p.m. and after the ceremony," Zhou said. The two rehearsals on July 30 and August 2 tested the plan and proved effective. "We will improve it according to real situations." Zhou said 28 direct non-stop bus routes would link the Olympic core area to the rest of the city, while 48 regular bus routes and three metro lines also connected the area with the city. When the third rehearsal is held on Tuesday, the government plans to add 40 stops along the 28 direct bus routes and extend the operation time of metro lines, in response to public demand. On Friday evening, all metro lines, except the airport line, will operate round the clock. 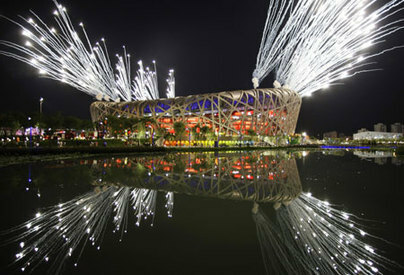 "Many Beijing residents may want to watch the fireworks outside the Bird's Nest on Friday evening. We are still working on a solution about how to manage the situation," Zhou said. "We are confident of providing good traffic service to the Olympic opening." When asked about the traffic after the city adopted the even-odd ban on vehicles based on licence plate numbers, he said the general traffic had been greatly eased but the downtown area with its higher density of population still faced congestion in peak hours. The traffic flow along the city's 20 trunk roads was reduced by about 20 percent but remained heavy. Traffic jams happened along the Second Ring Road where one of the three lanes was reserved for Olympic-related vehicles. "Traffic control will be tighter on Friday. I suggest residents not to drive their own cars and to avoid main routes," Zhou said.